The last 47 days or so of my life has really felt like I fell down the rabbit hole. It never ceases to amaze me when when I see up close how quickly a life can change. Anytime a person is faced with a major life change, it’s easy to see who loves you through thick and thin, and who….well, doesn’t. We forget that it isn’t just death we grieve…. This Summer has ended up being a flurry of activities and classes for the kidlet, interspersed by doctor visits, scans, tests, and a lot of speculation. The day before yesterday was the day. The day it all became real. The day the neurosurgeons got a hold of my case and the day we were to learn what direction this was all heading. Was I shaving my head? (If I was, I’ve been growing my hair out for almost 4 years so I wanted the chance to donate it.) Am I having brain surgery? What the hell is going on?? Tuesday was a long day. We drove up to Georgetown University hospital (because in the midst of the insanity that makes up my every day, I always seem to be where I need to be when I need to be there…..but that’s another blog.) I met with the Head of Neurosurgery (to sum up the overwhelming opinion of that….”how the hell did you pull that off??! !”) because, apparently my case is a pretty interesting case. The doc took one look at my scans…. ….and said ” I am NOT going in after that.” It’s a small tumor, but as I have learned in the past few days, it’s very deep in the brain and incredibly close to my brain stem. So Head-of-Neurosurgery asks his nurse to page Head-of-Radiology, Dr. Collins. Saving me another very long day for a consult, and because it was the end of the day, Dr. Collins decided to come over to Neuro to take a look. My first thought was “oh, yay…he’s awkward like me. This is going to be okay.” I guess I can appreciate that doctors are scientists and spend the first 25 or 30 years of their lives in school, internship, residency, and immersed in learning, so a little social awkwardness is a good thing. At least to a fellow socially awkward lover of science like me. Dr Collins concurred that this particular case is “interesting” (read: difficult and unusual) so he’s leaning towards what they kept referring to as radio-surgery. It looks like because of where the tumor is, how deep it is, and how close to the brain stem it is, that’s it’s basically an inoperable tumor. The good news is that it’s still small enough to be a candidate for radiation treatment, because apparently these tumors (well, any tumor) are not treatable by radiation if they get too much bigger than mine is. So, right now I’m waiting for the Friday meeting they have in Georgetown where the doctors all get together and discuss cases. I guess it involves a lot of math because Dr. Collins said he needed to figure out probabilities of success and everyone seems to be really worried about any possibility of damage to surrounding nerves, tissues, and especially the brain stem. 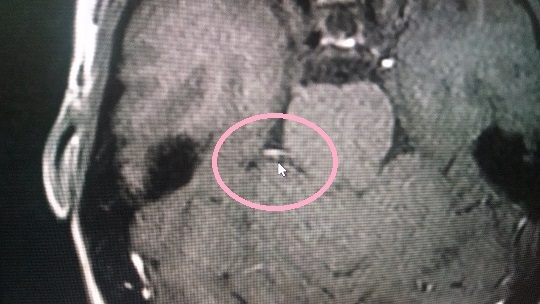 I didn’t realize how deep the tumor was or how close to the brain stem. Guess that’s not good. To sum up, the reality in my life right now is that it’s looking like radiation treatment is my best option, and if the docs hit the go button, then it becomes a matter of planning for the need to stay up in DC for a week and scheduling 5 treatments. The good news is there’s no shaving of the head and brain surgery, I live in a place where I have access to some of the best doctors and treatments available (I’m very grateful!! ), and hopefully this will destroy the tumor and live moves on. The other news is I’m pretty sure I’ll wind up in the medical journals. Again.